I’m beginning to really love this man. Rep. Tom Tancredo (R-Littleton, CO) is beginning to look like a true leader for the House of Representatives. First it was his anti-Shar’ia legislation that he introduced to the US Congress and now it is this. U.S. Rep. Tom Tancredo (R-Littleton) introduced legislation today that would effectively move the United Nations headquarters out of the United States. The legislation is being introduced amid incessant anti-American and anti-Jewish political grandstanding from the podium of the General Assembly. Tancredo’s bill, dubbed the U.N. Eviction Act, would direct Attorney General Michael Mukasey to initiate condemnation proceedings against all United Nations properties within the United States, and sell the property to the highest bidder on the open market. The proceeds will be given to the Treasury Department to pay down the national debt. The bill would also bar the future purchase of property in the United States or U.S. territories by the U.N. or any of its agencies, and revokes the diplomatic privileges and immunities that U.N. officials and representatives currently enjoy. “I refuse to sit idly by while Americans are forced to host Islamofascist dictators, like Mahmoud Ahmadinejad, so they can spew anti-American rhetoric just blocks from Ground Zero,” Tancredo continued. The organization has also become little more than a rubber stamp for Chinese and Russian foreign policy initiatives – blocking membership by the democratic nation of Taiwan in the world body, and failing to take any meaningful steps to halt the ongoing genocide in Sudan or the illicit nuclear programs in North Korea and Iran. It is high time that the United States pull out of that Tower of Babel and reject all ideas coming from its walls. The ground (after a good decontamination clean-up) could be turned into a more useful and rewarding place. Low cost housing, a new school, a hospital or even a park. There the people of New York would not have to put up with the likes of Hugo Chavez or Mahmoud Ahmadinejad. Just think of the happy dogs roaming in a lovely park, doing their business where once these men spoke their words of hatred. 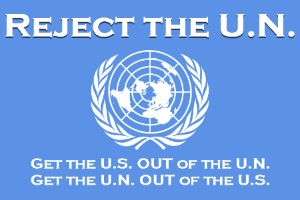 Another good result in leaving the UN would be the billions of US taxpayer dollars that we would save each year. Money that has been used for corruption and greed by the UN since the 1960’s. This money could better be used to help reduce the US Debt. The City of New York would benefit the most. For their taxpayers are forced to pay extra to have the honor of hosting the UN. Instead they would no longer have to foot the bill for the extra police needed when the UN General Assembly meets or when one or another of these diplomats (and I use that term loosely) decides not to pay parking tickets, have car insurance, commits a crime or any other offense that they are known to do. Way to go Congressman Tancredo. This nation needs more men and women in the Congress with your ideas and beliefs. Filed under: Tom Tancredo, U.N. Eviction Act, United Nations |	Comments Off on Tancredo: UN GET OUT! 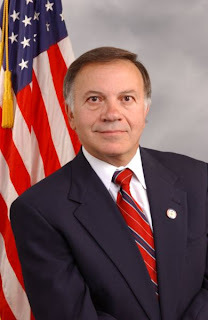 Tom Tancredo (R-Littleton, CO), pictured right, has proposed legislation that would prevent Shar’ia Law from becoming legally binding in the US. This bill would also deny U.S. visas to advocates of ‘Sharia’ law, expel Islamists already here. Tancredo pointed to the results of a recent poll conducted by the Centre for Social Cohesion as evidence that the U.S. should act to prevent the situation in Great Britain from replicating itself here in the United States. The poll found that some 40 percent of Muslim students in the United Kingdom support the introduction of Sharia law there, and 33 percent support the imposition of an Islamic Sharia-based government worldwide. I expect to see CAIR and the ACLU start challenges to this bill the minute it is signed into law. And if the Supreme Court has a majority of liberals on it (as it would under Barack Hussein Obama) then not only will this be thrown out but Shar’ia Law and No-Go Zones will become Standard. But if John McCain wins in November, the court will uphold this law. The stakes this November are very high. For an Obama win is a win for Jihadists everywhere. Is a win for those who will (not might) destroy the very fabric of our society and place instead an Islamic regime, headed by a Muslim: Barack Hussein Obama.